Over the years, drinking coffee has evolved from being a simple dining routine, mainly in Western countries. Whether it is just a trend or a long-term social practice, drinking coffee today reflects a modern lifestyle and sophistication that has gained considerable growth around the globe. The proliferation of coffee shop chains such as Starbucks is building awareness of new coffee-based drinks. Global coffee sales increased only 1% in volume there years ago but nearly 11% in value to USD 41 billion and this increase in value reflects the growing preference for specialty, premium coffee machines. Goldstein Research analyst forecasts the global coffee machine market size is set to reach USD 4252.76 million by 2024, at a growing CAGR of 37.98% over the forecast period. Due to growing population, rising working class population and increase in disposal income that is spent on drinking coffee is expected to increase the demand for coffee machine over the next coming years. The report covers the present ground scenario and the future growth prospects of the global coffee machine market for 2016-2024 along with production and growth rate. We calculated the market size and revenue share on the basis of revenue generated from major players across the globe. We have forecast the market on the basis of rising rate of hospitality sector and number of coffee machines installed in various facilities. On the basis of end-user, coffee specialty stores holds the largest revenue share of 68% of the total coffee machine market in 2016 and is likely to maintain its dominance throughout the forecast period. Due to increase in the working class population and change in lifestyle the coffee consumption is increasing. Whereas in the residential market is expected to grow at the considerable CAGR of 37% over the upcoming years due to increase in the disposal income. Coffee Machine Market Outlook 2016-2024, has been prepared based on an in-depth market analysis from industry experts. 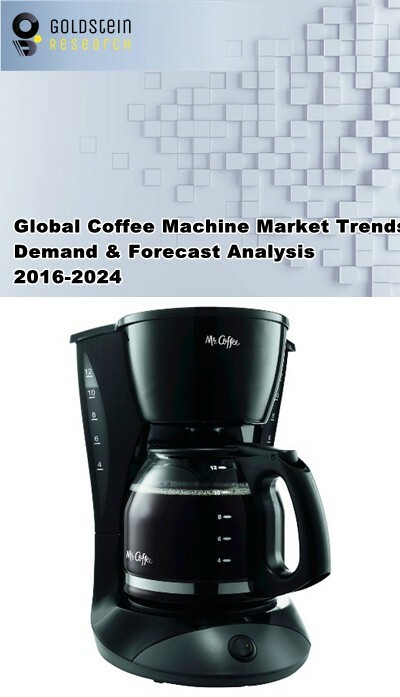 The report covers the competitive landscape and current position of major players in the global coffee machine market. The report also includes porter’s five force model, SWOT analysis, company profiling, business strategies of market players and their business models. Global coffee machine market report also recognizes value chain analysis to understand the cost differentiation to provide competitive advantage to the existing and new entry players. Our global Coffee Machine Market report comprises of the following companies as the key players: Keurig Green Mountain, Panasonic, Nestlé Nespresso, Jarden, Delonghi, Electrolux, Melitta, Morphy Richards, Philips, Hamilton Beach, Illy. Other high-flying vendors in the market are: Bosch, Tsann Kuen, Krups, Jura, La Cimbali, Fashion, Zojirushi, Bear, Schaerer. According to the report, major driving factor for coffee machine market is addiction of people towards coffee as one of the favorite to-go beverage and increase in the number of coffee outlets in developed regions majorly in North America and Western Europe. For instance, UK coffee shop market will majorly exceed 30,000 outlets and USD 17.9 billion turnover by 2024. Further, the report states the major challenge is the substitutes of coffee machine like tea, herbal drinks and other instant beverages. Instant beverages are the growing market and especially this growth is coming from the developing countries and large number of instant mixes focuses to recreate the drinks which are normally served in the specialty coffee shops. Based on geography, North America held the largest share i.e. 35% in the global coffee machine market in 2016 due to increase in consumption of drinking coffee. With the increase in coffee specialty stores the market of global coffee machine is increasing rapidly. Asia-Pacific is expected to have highest growth over the forecast period due to huge consumer base and rapid urbanization in developing countries like Japan, China, India, Australia, and New Zealand. What is the revenue of Coffee Machine in 2015-16 and what would be the expected demand over the forecast period?